Go go go! You're a hero survivor walking in an incredible and a huge Jurassic world rainforest, where your mission is to stay alive. In this exciting dinosaur simulator game only one winner, you or your enemies - ruthless bloodthirsty dinosaurs. You don't have to be a dinosaur digger and dig the ground in the search of dinosaur bones and fossils, in this epic video game of the dinosaur apocalypse the dinos aren't extinct. Dinosaurs were created from DNA, and further dinosaur evolution is now going. These dino creatures are formed from eggs long ago and are enormous. Dinosaur era has come. Dinosaurs among us. These reptiles and their animations are as real. Become an ultimate heroic dinosaur hunter, strike the dinosaurs, catch your prey! 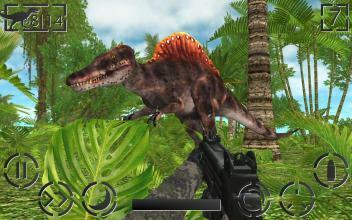 Be careful, because in this dinosaur safari adventure with a mix of action and danger, not only you're hunting in the forest, but also you're being hunted. It's not a dino zoo Jurassic park, it's dangerous and breathtaking terrain, a lush natural environment in the tropics, inhabited by the legendary dinosaurs also called dragons. In this adrenaline game you have no car, and beasts everywhere. The survival guide is simple: hit and smash these horror villain lizards. 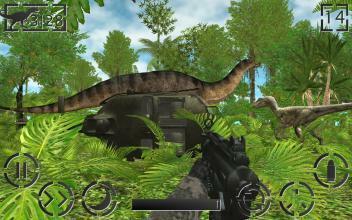 You're a dino hunter or prey in this exciting dinosaur hunting safari game? Play and you'll find out. This dinosaur sim starts from the home base. 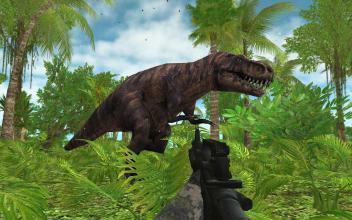 In this dino world quest in the tropical forest your mission is to destroy a certain amount of hunting for you prehistoric predators at every level. If you'll survive in a fight thanks to your battle skills of the assassin, then for each completed level you'll get a new more powerful gun in your weaponry. In this hunter age, craft your way to the full weapons arsenal to have a choice of weapons and to increase your chances of survival. 15 high powered weapons of different types are available: pistol, grenade, machine gun, sniper rifle, submachine gun, light machine gun, carbine, shotgun, flamethrower, grenade launcher, rocket launcher (bazooka). Hunt and look at the photo-realistic dinosaurs, from small to giant, from herbivores to carnivores, in this fabulous simulation. This outstanding high-end shooting game of hunting in the jungle gives you the wonderful opportunity to explore and dive into the impressive super dino adventure. The game scene has a great dinosaur land in the woods far from city with many dino species, each has a specific roar sound. Carnivorous: dinosaur king Tyrannosaurus (T. Rex), Velociraptor (Raptor), Giganotosaurus, Carnotaurus, Spinosaurus. Herbivorous: Triceratops, Apatosaurus (Brontosaurus), Ankylosaurus, Stegosaurus and Parasaurolophus! You can rescue your life by a speed run racing yourself from dinosaurs or attack them in this dinosaur war. Do not stand still, fire and reload your weapon's charge, it isn't a dinosaur puzzle. Move, at this time your damage value from a clash with the ancient monsters will gradually decrease. If you need to take a rest after active battles on this survival arena, make a break using pause mode, where you'll be completely invisible. 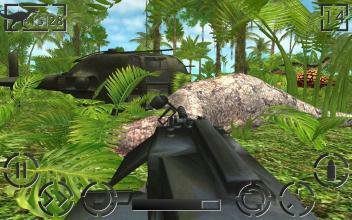 In this extreme survival simulator there are 15 levels with increasing difficulty. 15 weapons with increasing power to expand your arsenal. Big dinosaur animals that'll have a dinosaur rampage and that'll chase and attack the enemy, which is located on their territory. They can hear your noise. And they'll be quick and deadly to you. 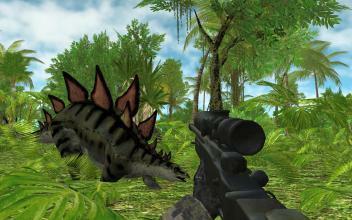 Enjoy the dinosaur hunting game 3D in the gorgeous overgrown jungle map of the lost world with a variety of vegetation. Discover the inspirational beautiful location of a wild nature of the age of extinction like in movies or wallpapers, hunt and gather your weapons, and try to pass all levels. 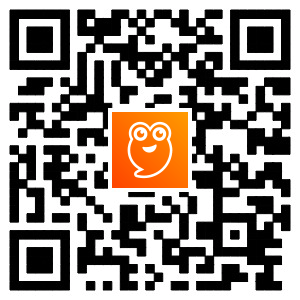 Astonishing 3D graphics and amazing, immersive gameplay of this app are providing a dramatic live experience and are helping you to travel into the fantastic dinosaur world of your dream, right on your mobile device screen, including phone and tablet!